Six & Ten Studio is a full service creative studio specializing in photography, design and styled event production. Six & Ten Studio was created in 2016 with the intention to provide support to the creative community and the entrepreneurs behind it. Six & Ten has a multidisciplinary design team made up of women with a collective experience in drawing, illustration, visual merchandising, fashion design, pattern-making, web design, graphic design and photography. Our first studio space was located at 610 16th Street in Oakland, which is where we derived the name from. But after some research into numerology, which says the number six is artistic, with a nurturing disposition, and community oriented; while the number 10 is known as an initiator of action, a pioneering spirit with inventive ideas, and courage - it just felt right and stuck with us. In 2018, we outgrew our first studio and are in the process of creating a new larger and more suitable space to continue nurturing & supporting our creative community. Are you interested in collaborating with us? Email us. A redesign and rebrand of C Wagner Photography’s wedding & engagement website. New logo and new platform. Previous site was a Zenfolio site. Blogs were carefully transferred over with SEO optimization. The client had the logo already created from a previous designer and we used that to base her new site. We worked to create photography collateral, website copy to be on brand. 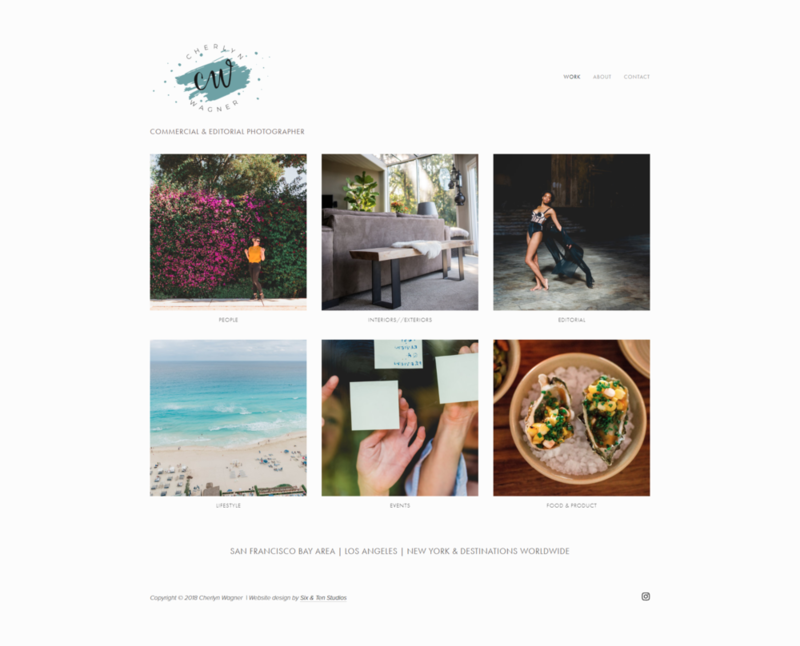 Cherlyn wanted to separate her two photography sites and requested a clean simple design. Interested in working with us? We have some open collaborations available for April & May. We are offering a 50% discount on web development and branding services. If you’d like to work and collaborate with us - let’s connect! We’d love to help you create a website you feel good about, that aligns with your business, your authentic self and one you can update on your own and have control over! All web + branding development cases come with a one-on-one consultation, two meetups (online or in person) and up to 3 web pages + squarespace tutorial for upkeep with 30 days of troubleshooting. Promotional offers start at $599 per project (regular rates start at $1299). Most collaborations take between 4 weeks, depending on client approval, contribution and collaboration.